I sat before this extraordinary sole, wondering as I chewed each buttery, spright, sumptuous bite of fish, "Why have I never made this dish before...?" My Sole a la Grenobloise (as prepared in the city of Grenoble, the south-eastern region of France) was pulled from Saveur's 'The Beauty of Butter' special issue, No. 109. The word butter itself was such an obvious, delicious clue to all that might await in the pages, but the pages remained unsmeared by my buttery fingers, until recently. What a simple dish to delight your guests! Aren't these beautiful sole filets? Soak your sole in milk, and season with salt and freshly ground black pepper. The recipe is here, and it's not difficult to make, merely astounding to eat. You can purchase the clarified butter required or take a little time to do it yourself as described here. I would add a final spray of lemon over the sole before serving; the shock of acid truly brings the dish to life. Otherwise, serve it with white rice and a side dish of green beans almondine, the basics from geniuskitchen.com found here. Do enjoy! Sometimes recipes stir me to make something else entirely with them. I was intrigued by a recipe for a fava bean stew, but then I thought of the shrimp we had in the freezer, considered cannellini beans, and wondered how it might all go on top of creamy polenta. I made the Cyprus fava bean stew, known as Koukkia Kounnes, from Saveur magazine, but tinkered with the recipe (see below,) using a 15.5 oz. can of white cannellini beans instead of favas and used about half the amount of suggested chicken broth. I let it simmer for quite a while, along with the garlic, thyme, onion, and bay leaves, until the liquid all but evaporated--now I had a luscious, fragrant confit of beans! While the stew slowly simmered, I prepared the polenta. When the polenta was nearly done cooking, I sauteed a dozen thawed shrimp in olive oil with zest from a whole lemon, some smashed garlic, salt and pepper. Once the shrimp were cooked, I removed them with a slotted spoon and covered with foil to keep warm. Reduce the zesty sauce to thicken slightly. The perfect forkful: spoon your polenta on two plates, and add the confit of beans. Top with shrimp and pour the reduced sauce over that. Get a hold of that fork and dig in! Serves two. Heat a dutch oven over medium heat, and add the oil. Add the onion, garlic, thyme, and bay, and cook, stirring occasionally, until soft and lightly browned, about 15 minutes. Thanks to ellysaysopa.com for adapting the recipe online. I have to admit that peppers and spicy foods in general have turned on me and I have to pause for a Prilosec from time to time. But I did think Saveur's recipe of chicken thighs with peppers, chorizo, and brown rice was worth investigating and adjusted it accordingly. Good news is, our immensely satisfying dinner didn't suffer from the omission of red peppers and chorizo. I used sweet sausage instead of chorizo to delicious results and we didn't miss the peppers at all! Add Stubb's liquid smoke instead of chorizo for smoky flavor, if you'd like. However you choose to make this wonderful one-pot dish, I would definitely use more oregano than the 2 tbsps suggested--and then summon a hungry bunch. I'd like to clear up something: There's very little mystery to clarified butter or making it. 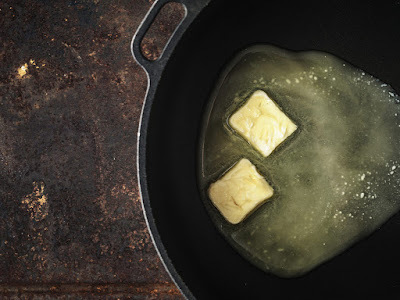 Clarified butter means that the milk solids (whey) and water have been removed from the butterfat to ensure a high smoking point in cooking, ie., the butter can take higher temperatures without burning. 1. 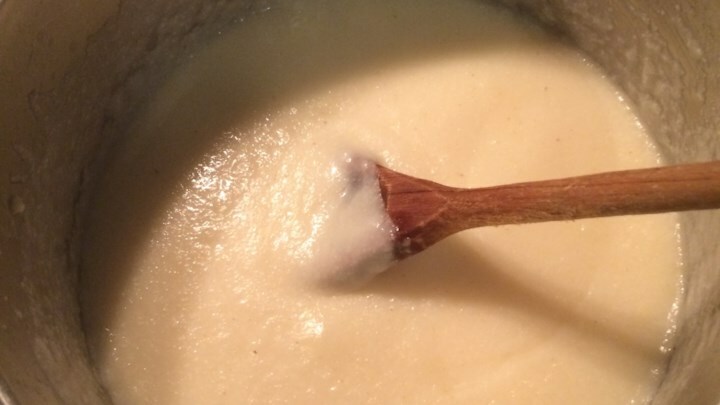 Bring your butter to a boil (probably at least a stick; if you don't need it all right away, clarified keeps for a long time when covered and refrigerated) and let it foam white and sputter for a while. 2.When the butter stops foaming and the noise settles down, turn off the heat immediately and skim off the solids. You're done. Try it in the microwave if you'd rather. Thanks to So Delicious Recipes for the image! While it may be inadvisable to wear white after Labor Day, this pale, creamy gazpacho from foodandwine.com made with cauliflower is highly recommended (at least by me) all through the year. I substituted walnuts that I already had on hand for the suggested pine nuts and almonds to great effect, I thought. I would recommend (here I go again) that after blending all the ingredients together, to push the solids with the back of a wooden spoon through a fine mesh sieve over a bowl and refrigerate the thinned soup then. Try it with toasty bread in the cooler months to take off the chill! In a large saucepan of boiling salted water, cook the cauliflower until tender, about 8 minutes. Drain, rinse under cold water until cool and drain well. In a blender, combine 1 1/2 cups of cold water with the cooked cauliflower, bread, pine nuts, chopped garlic, sherry vinegar, chopped shallot, 1 cup of the slivered almonds and the coarsely chopped cucumber; blend until smooth. Add the olive oil and pulse just until incorporated. If necessary, add more water to thin the gazpacho. Season the soup with salt and refrigerate until chilled, about 1 hour. Preheat the oven to 350°. Spread the remaining 1/4 cup of slivered almonds in a pie plate and toast for about 6 minutes, until fragrant and lightly golden. Ladle the gazpacho into bowls. 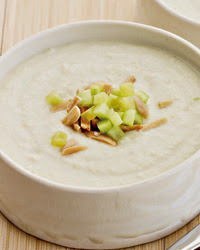 Garnish the soup with the toasted almonds and the finely diced cucumber and serve. First published in part in Food & Wine. Thanks to contributor Joy Manning and photographer Hallie Burton! In need of polenta, but fresh out? Do you perhaps have some popcorn? Throw it in a blender! At a high speed, the blender (a Vitamix fitted with a dry-grain container is ideal) will grind the popcorn to a coarse cornmeal powder--exactly what you need to make your polenta dish. A cup of ground polenta will serve at least four people once prepared. Follow this link for 'perfect polenta' of your own, courtesy of allrecipes.com. A little salt, butter, cheese and several cups of water on the boil are the basic ingredients for a creamy side dish, but certainly tailor your polenta to your taste. If you have never tasted or made polenta before, it's a must try! A note: The polenta may take longer to cook than the suggested time and may need more water to acheive the perfect consistency, so plan accordingly. Thanks to Karen Haggenmaker at allrecipes.com for the silky, satisfying polenta photo! Aren't tomatoes just great at the height of the summer season? Try grating them! Rub several whole tomatoes against a grater, skins and all, and let the juicy bits run into a bowl. Discard the tomato skin that didn't go through the grater and you have a bowl of instant tomato sauce. Try this method using a yellow tomato, and stir it into steaming pasta with some sea salt, fresh ground pepper, perhaps some chili flakes, and a crushed garlic clove. Or win the children over by grating a ripe beauty over their mac 'n' cheese, as above. Spread the sauce over toast, bake into, or use with any number of things that require the benevolence of summery tomatoes. Suggestions welcome! Do enjoy! Isn't she a beauty? I picked up this bunch of red basil at our neighborhood farmer’s market over the weekend and after one deep inhalation I was reminded of a bunch of other things, too—the house in Riverhead, Long Island, perched on a cliff with a breathtaking view of the Sound...the house full of hungry guests one summer in Riverhead, Long Island, where I first fed my desire to cook. Fresh basil served us for a season of fresh tomato sauces, gazpacho and ribbons of the stuff on cornmeal-dusted, crusty pizzas, all full of the vibrant flavor and aroma released from the leaves. Why not simply chiffonade a bunch of basil to boost any summer salad as well? Pluck the basil leaves from the stems and then roll a few of them up tightly like a cigar. Slice thinly on the bias for a familiar taste and yet a surprising, enhancing flavor when added to your greens! At first, it wasn't so much of a celebration as it was a whim surrounding what we already had in the house--including a visiting bunch of our neighbor's feisty children--that brought our bowtie pasta, spaghetti, a jar of Prego sauce (click here for homemade suggestions) and ground beef to the table. We were a little on the early side for Fourth of July, but the little ones lit up like firecrackers at the display of our dish just the same ! I always maintain that a little ingenuity is a vital ingredient in the kitchen and so, a simple dish of spaghetti acted as patriotic stripes of pasta and the bowties served as our stars. Our handsome ground beef came courtesy of Butcher Box (a sort of 'Meat-of-the-Month' Club) and naturally we wrapped it all up in a vibrant red sauce! While I take some time off to finish my new novel, I thought I'd leave you for the moment with a comment or two about tea! And no, not Constant Comment, but a lovely tea for two from the fine folks from Bellocq--No. 96 White Wedding Tea! 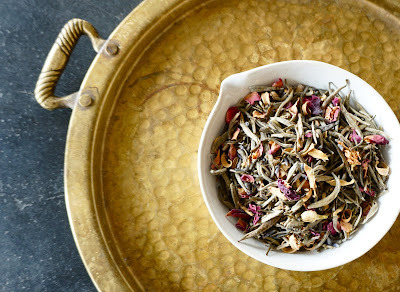 The hubs and I discovered this extraordinary brew featuring organic jasmine silver needle white tea, rose petals, organic lavender, and orange blossoms while enjoying an afternoon tea at The Blue Box Cafe at Tiffany's. We enjoyed our pot of tea over a smattering of finger sandwiches and a few molar-crushing sweets at Tiffany's petite eatery done up in signature robin egg blue, but I imagine the gentle perfume floating off the cup would be welcome whenever you wish. Cuddle up then, with a good book (perhaps one of mine) and a warming cup of tea over the next few months as I work on my book and pursue the wisdom found in the leaves. Do enjoy! 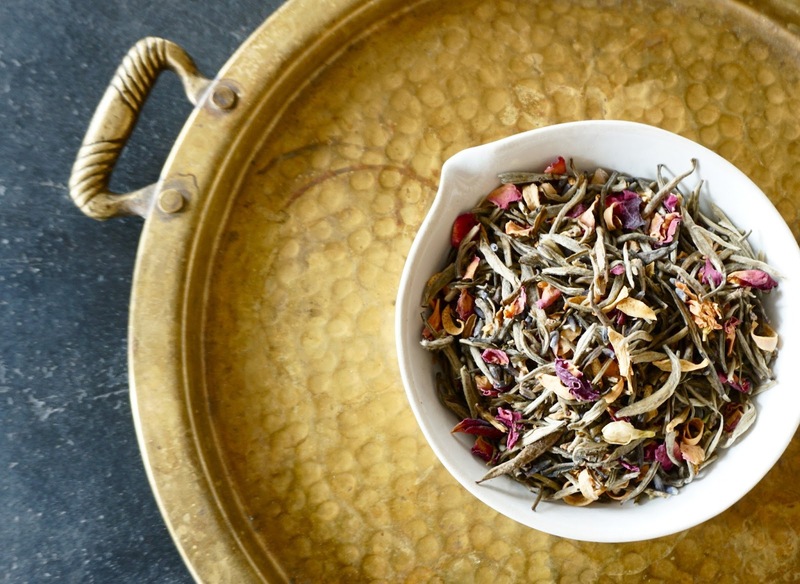 Bellocq Tea Atelier is located at 104 West Street in Brooklyn, but you may also find the tea online, as well as a host of their other special blends. Thanks to Bellocq for the photo!